When a user refers to water “quality", frequently he or she first mentions its “hardness", i.e. its lime concentration. This concentration depends on the region, the geology of the area, sometimes the locality, the pumped water sources and the water treatment methods used by upstream distribution companies, i.e. before its point of entry into buildings and points of use: taps and pipework. These undesirable effects affect all of us in all aspects of our lives. Make sure your water is free of lime with suitable treatment solutions ! By eliminating lime from the water, water softeners are still a simple and reliable solution for eliminating limescale throughout the household and for providing consumers with the benefits of soft water. The proven benefits of using soft water include improved comfort, improved well-being and physical sensations, better equipment performance, energy savings, financial savings and reduced pollution. 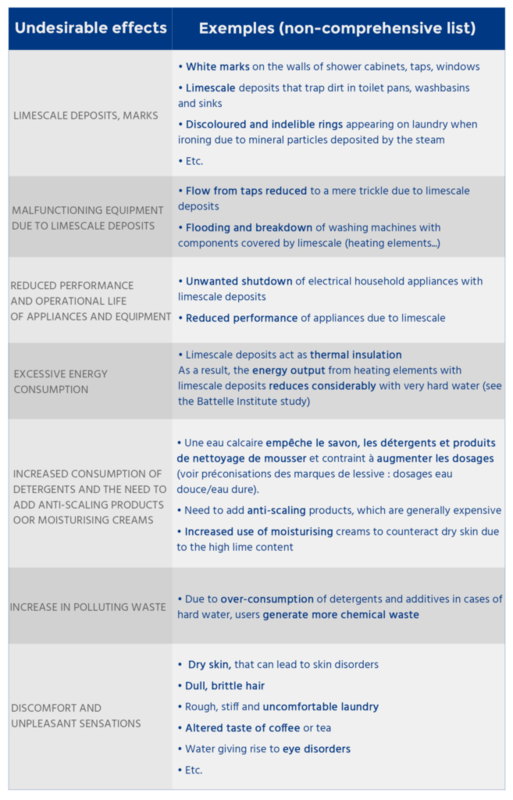 Although all water softeners work on the same ion exchange principle (or the sodium cycle), different types of appliances are available on the market, distinguished essentially by the valve technology applied, water and salt consumption for regeneration, the regeneration triggering method (by time, by volume, by anticipated volume, etc.) and by certificates of compliance with particular standards. Water softening prevents the formation of limescale: part of the minerals that form it are removed from the water; they can no longer cause the solid, whitish deposits better known as fur or limescale. Water softeners provide truly soft water, protect pipework and all domestic applications and provide the comfort of soft water (for skin, laundry, etc.). extend the life of your car battery. prevents clogging of bath and shower tubes and nozzles (water jets, hydromassage, etc. ).